Alan Wake's American Nightmare is a story-driven action-horror video game, developed by Remedy Entertainment and published by Microsoft Studios. The game is a downloadable follow up to its predecessor, Alan Wake, but is not a sequel. The game is an Xbox Live Arcade title and was released February 22, 2012. A PC version will be released May 22, 2012. 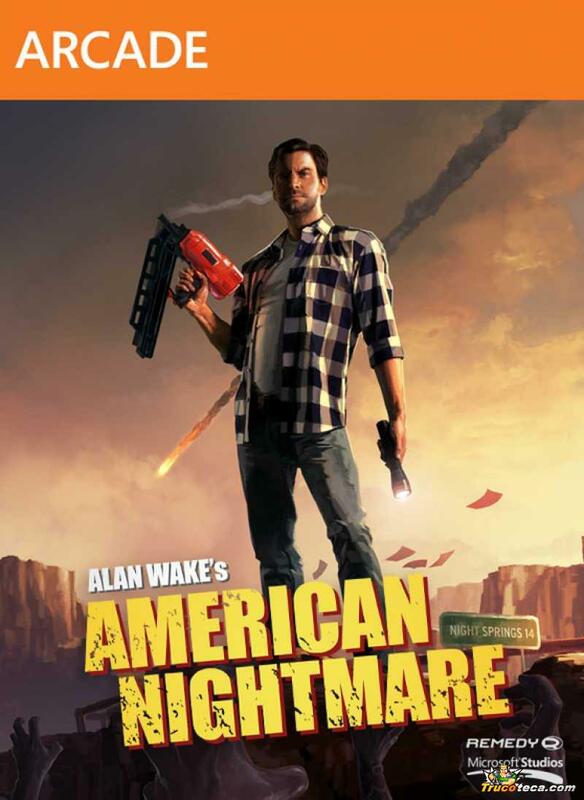 American Nightmare is set as an independent game and does not reflect on the major storyline of the franchise. It only exists to broaden and expand the universe. Matthew Porretta returns as Alan Wake/Mr Scratch, and Brett Madden is back as Alice Wake. Fred Berman reprised his role as Barry Wheeler. The plot of American Nightmare is framed by the narration of an episode of "Night Springs" (in the style of The Twilight Zone), running while Alan Wake's friend and manager, Barry, is asleep in a motel room. The narration explains that Alan is attempting to chase down "the herald of darkness", Mr. Scratch and Alan's evil doppleganger created by a dark force, who is attempting to take away everything Alan loves, including his wife Alice. Alan, who as the champion of light has the ability to write a new reality, has been able to write his escape from Cauldron Lake in Washington, ending up near the small town of Night Springs, Arizona. He learns that he has been missing from the real world for nearly two years. A nearby oil derrick erupts with several foes controlled by Mr. Scratch to kill Alan. Alan encounters Emma Sloan at a nearby hotel, who believes he is the same as Mr. Scratch that was at the motel the night before. She provides Alan with a typewritten page, a way to alter reality to destroy the derrick and stop the foes. Alan accomplishes the required change, sending a satellite out of orbit and crashing through the derrick, but in the confusion, the dark forces consume Emma. Alan looks to answers at a nearby observatory. There, Dr. Rachel Meadows, who also met Mr. Scratch previously, is tracking a mysterious signal sent just before the satellite was knocked out of orbit. Alan helps to repair the telescope, obtaining a portion of the signal that translates into part of a story, a new reality that Alan can change. The incomplete message points him to the nearby drive-in theater, where Serena Valdivia, under the influence of Mr. Scratch, attempts to prevent Alan from getting to the projection room where Alan can change reality; Serena mentions that Mr. Scratch is trying to prevent the sun from ever rising again. Alan eventually evades her, gaining the access code to the room, and uses the incomplete message to try to set the new reality. However, as the message is only partial, the new reality does not take effect; Mr. Scratch appears, and gloats to Alan, sending him back in a time loop to a few hours before. Waking back up near the motel, Alan repeats many of the same motions, though both Emma and Rachel have some deja vu of the previous loop's events, and have helped Alan with some of his tasks. However, Emma is still consumed by the darkness, and Rachel is only able to capture a longer, but still incomplete, portion of the message. When Alan returns to the drive-in theater, he again is unable to complete the new reality and set back in time again by Mr. Scratch. He repeats his actions for a third time, but is able to save Emma and gain the complete message from Rachel. Alan sets the correct series of events in the projection room, ending by projecting a film made by Alice onto the screen. Mr. Scratch appears again but discovers that Alan has successfully written the new reality, and he is burned out of existence by the film. On the screen, Alan appears to reunite with Alice along a sun-lit shoreline; however, the narrator notes that this could quite possibly be just a figment of Alan's imagination since he is still trapped in the dark place. After completion of the game's credits, Barry wakes up suddenly believing to have heard Alan's voice.